A blog intended to educate and inform those interested in industrial control instrumentation and process control equipment. Weekly posts on various subjects ranging from pressure / temperature / level and flow instruments, control valves, analytical instruments, drives and actuators, recorders, and process weighing. 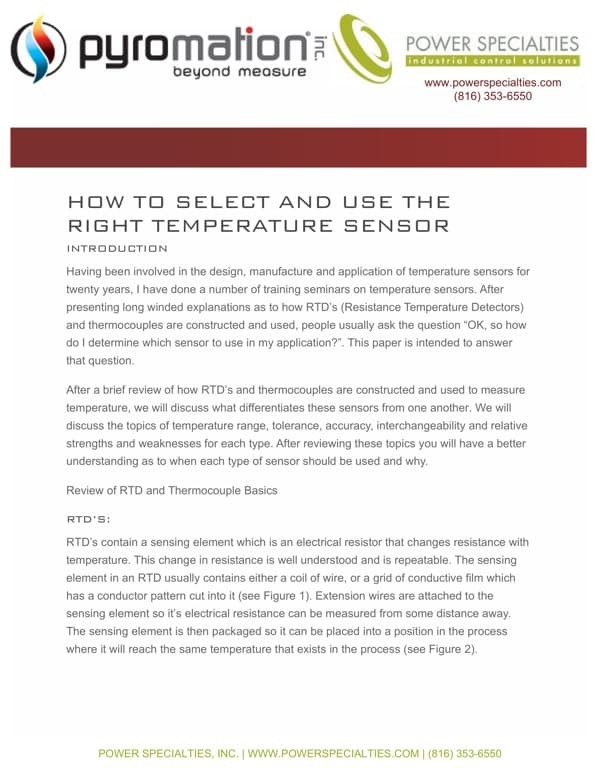 After a brief review of how RTD’s and thermocouples are constructed and used to measure temperature, this white paper discusses what differentiates these sensors from one another. You will learn the topics of temperature range, tolerance, accuracy, interchangeability and relative strengths and weaknesses for each type. 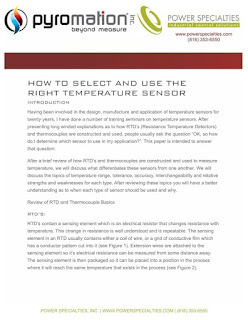 After reviewing these topics you will have a better understanding as to when each type of sensor should be used and why. Courtesy of Pyromation and Power Specialties, Inc.
SENCOM™ 4.0 Platform technology allows pH and ORP sensors to transmit and receive data when connected to FLXA402 analyzer or to any PC/tablet with Mobile Field Device Management (FieldMate) installed. Designed with a strong focus on Yokogawa’s digital SMART sensors, the SENCOM SMART Sensor Platform provides greater insight and enhanced capabilities to deliver more credible data throughout the entire product lifecycle. 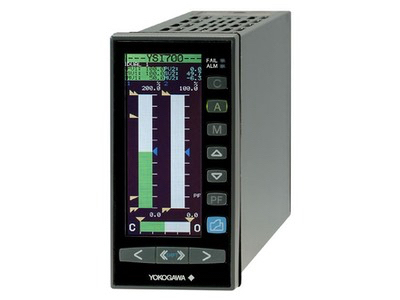 Yokogawa’s SENCOM SMART Sensor Platform is an innovative analyzer platform that optimizes maintenance, reduces configuration time, and simplifies in-field maintenance and calibration. For more information, contact Power Specialties, Inc. 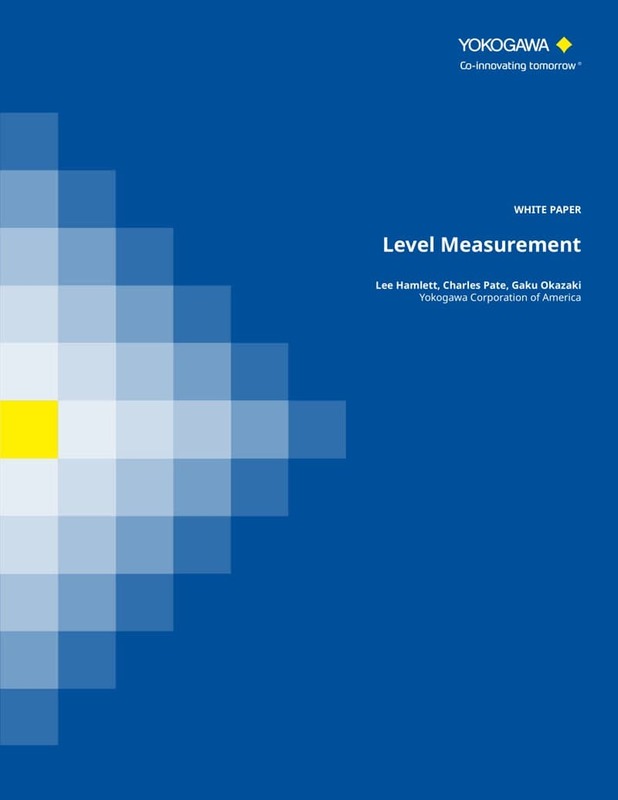 This paper, courtesy of Yokogawa Corporation of America, covers level measurement using differential pressure (DP) level transmitters. A DP level transmitter uses the head pressure and specific gravity of the media to infer the level in the vessel. It is a widely-used level technology having the advantage of being based on a well-understood principle. It is an excellent selection for clean liquids but also works well with viscous liquids and slurry/sludge; but, is not recommended for solids. The disadvantage is the limited temperature operating envelope of the transmitter. Adding a remote diaphragm seal system to the DP transmitter overcomes this limitation. Granular activated carbons (GAC) are prepared from a variety of local raw materials of vegetable origin such as wood and peat, or of mineral origin, such as coal. The presence of suspended particles in the production of corn syrups impacts the efficiency of steps in the refining process. These suspended particles are removed during clarification using granular activated carbon (GAC). GAC is used for both decolorization and to filter impurities such as amino acids and polysaccharides. A corn syrup producer was looking for a reliable, low maintenance level transmitter to measure GAC in a carbon column. 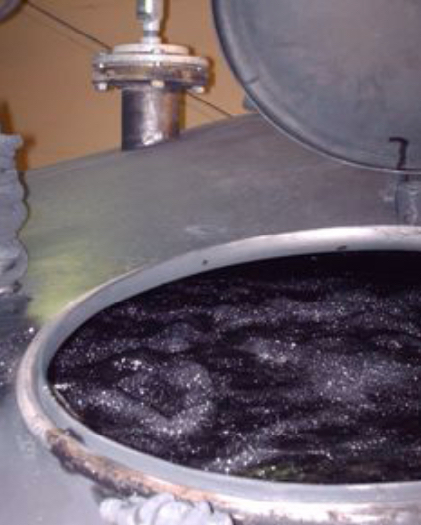 It is important to measure the granular activated carbon level because, after the GAC filters out the impurities, the spent GAC is then mixed and cleaned with water forming a slurry, which is pumped into carbon columns. The level of the granular activated carbon slurry in the column must be accurately measured so it can be separated from the water and conveyed back to the reactivation furnace. The level inside the column is critical to the efficiency of the re-carbonizing process. Other technologies, including the electromechanical displacer level systems, had been tried without success. The client wanted a reliable, low maintenance solution. The Hawk ORCA Sonar low frequency interface transmitter, with automatic sludge cleaning, was installed and tested. The ORCA's low frequency sonar was able to measure the GAC interface very accurately through the dirty, sticky and viscous black water. The ORCA system provided high reliability and excellent repeatability, which improved automation control and reduced maintenance downtime. The ORCA Sonar Bed Level transducer emits a high powered acoustic pulse, which is reflected from the interface density selected. The reflected signal is processed using specially developed software algorithms, that eliminate lighter floating densities and stratified layers, allowing measurement of RAS or BED levels. It can be calibrated to measure lighter densities like FLOC or one of the outputs could be used for a CLARITY output, similar to a basic turbidity transmitter measuring solids in suspension. By choosing the correct sonar transducer frequency, the ORCA sonar guarantees the optimized performance when measuring both light and heavy density interfaces. For more information, contact Power Specialties, Inc. Call them at (816) 353-6550 or visit their web site at https://powerspecialties.com. Pyromation is one of the leading manufacturers of thermocouples, RTDs, PT100s and thermowells in North America. As an ISO 9001-registered company, Advanced Manufacturing Firm and Lean enterprise with an onsite NVLAP-Accredited Metrology Laboratory (Lab Code 200502-0), the Fort Wayne, IN-based operation's team members are invested in providing the best solution for each customer's application. Pyromation produces a variety of temperature sensors and assemblies in both standard and custom designs, which can be found on equipment and in process applications in the chemical, petrochemical, power generation, food & beverage, dairy, plastics, heat-treating, oil & gas, pharmaceutical, aerospace, biomass, metal processing, rubber, mining, HVAC, water & wastewater, incineration and many other industries in North America and around the world. This video provides a short introduction to their capabilities, plant, and people. A study of the importance of gas composition and calibration and their effects on flow meter accuracy. 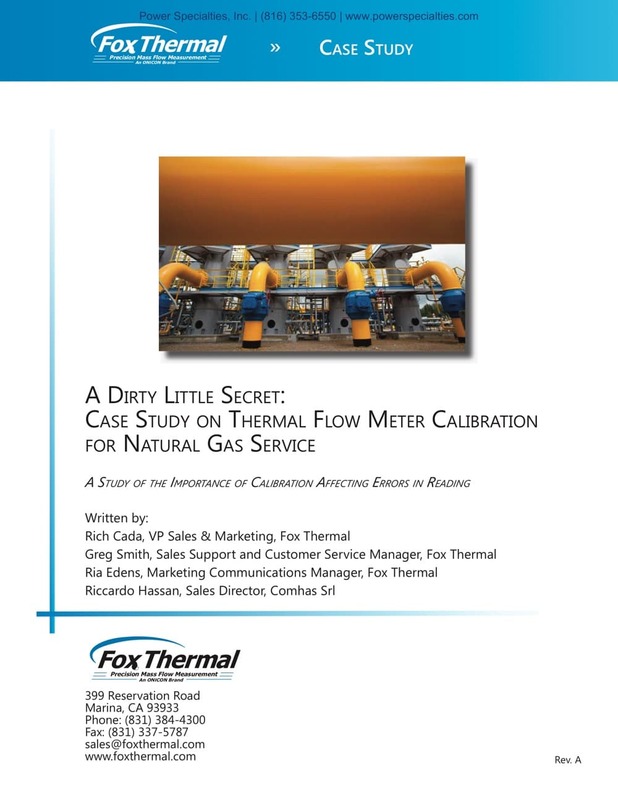 Errors associated with the calibration of flow meters for natural gas service can be costly but can also be mitigated using an advanced flow meter design that allows field-adjustment of the natural gas composition without loss of accuracy. Or, read the embedded document below. For more information, contact Power Specialties, Inc. by calling (816) 353-6550 or visit https://powerspecialties.com. 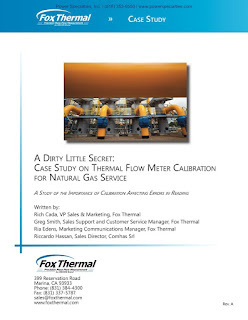 Case Study on Thermal Flow Meter Calibration for Natural Gas Service from Power Specialties, Inc.